Missouri is one of the states that has “one party consent” law when it come to recording phone calls. According to Mo. Rev. Stat 542.402.2, unless one party gives consent, it is a crime to intercept or record any wire, oral or electronic communication. 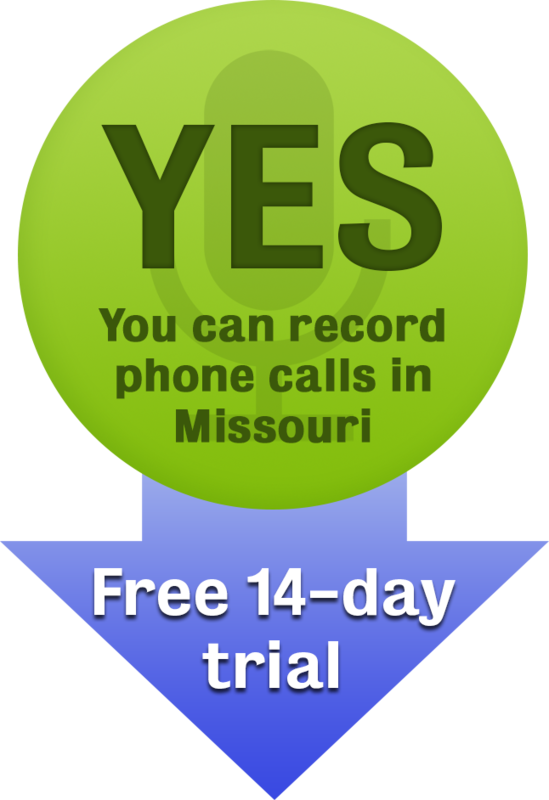 Therefore, when in Missouri, you are allowed to record phone calls if you are one of the parties to the conversation or if you get consent from either of parties to make the recording. There are certain instances when the Missouri recording law prohibits recording calls even if you were one of the involved parties. For instance, you may not record a phone conversation with the intention of committing a criminal offense or a tortious act or when you intend to use the phone recording as evidence in a trial. There are evidence rules that might preclude you from using the phone recording as evidence during court proceedings. Again, if you intend to record interstate calls, it is strongly advised that you get the consent of all the concerned parties since not all states have “one party consent” wiretapping law. See the list of recording laws by state. When found guilty, you are likely to face criminal prosecutions as well as exposing yourself to civil lawsuits which might see you pay monetary damages to the aggrieved parties. This is not to mention the litigation and the attorney fees. The wiretapping law in Missouri is silent on the specific methods that are to be used in obtaining phone call recordings. You thus have the liberty to choose whatever programs or gadgets you feel will help you get the job done. Secure Speak works in every state, including Missouri, and even internationally. With it, you get a number that you can 3-way into any phone call. Whatever that line hears gets recorded and sent directly to your email address when the phone hangs up. You can try Secure Speak today with a 14 day free trial period and evaluate its suitability in recording telephone conversations. Secure Speak is not a licensed lawyer and any statements do not constitute legal advice. Contact a lawyer for information pertaining to your specific case, and reference Missouri Statute 542.402.2 directly.